Frank Llyod Wright, Bachman-Wilson House @ Crystal Bridges Museum of American Art. At the beginning of November I posted about the travel grant I recieved from Crystal Bridges Museum of Art and the Terra Foundation. A week later I was on a plane from Charlotte to Bentonville for the Picturing the Americas Exhibit and International Symposium! Why am I posting these blogs a month later? Sometimes I like to give a little space between traveling and posting blogs, its nice to have a little time to reflect and take in everything you've seen. While I always take a lot of photos when travelling, rarely do I post those photos right then and there. Personally I find it to detract from the experience of a place when stopping to take time to Tweet, Facebook or Insta, not to mention the ensuing onslaught of likes and comments that are distracting as hell the rest of the day. My experience at Crystal Bridges really didn't need to be bothered by those things and my purpose for being there was to immerse myself in the American landscape tradition, which for me is a borderline quasi-religious experience that didn't need any of those external distractions. With that in mind here is the first in a week of posts about my trip to Arkansas. Similar to the Puerto Rico trip, I've chosen to break it into a few different posts so I can highlight some of the things I enjoyed most about my time in Bentonville. After starting out the trip on barely two hourse of sleep (thanks to some chattering coyotes and a loooong 3am drive to Charlotte) it was a relief to find a little inspiration in the air. I'm a bit of a topographic and aerial photography nerd, which is about the only thing I enjoy about flying. Going over the Appalachians and the farms of Ohio and Kentucky was the only thing that kept me sane. 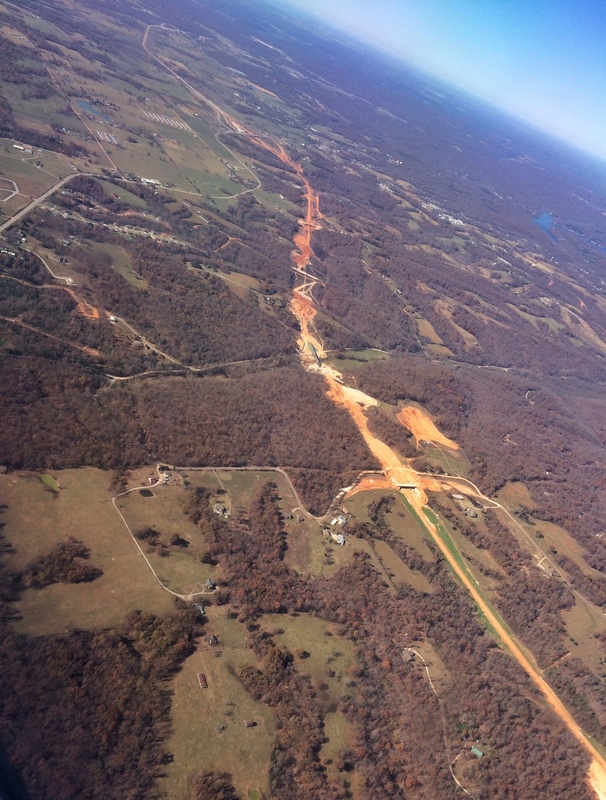 Above are a few in-flight shots descending over Arkansas into the Northwest Arkansas Regional Airport. The descent over rural Arkansas was beautiful in its topographic glory, full of farms and chicken houses about as far as the eye could see. As the home of Tyson Foods, its no wonder that there were so many chicken houses dotting the landscape and the way the silver metal buildings stood out against the November landscape was really striking. Although I'm sure the smell in August would leave a little something to be desired. I arrived late in the afternoon on Friday and after a long day of travel didn't have much time to explore the museum before the Picturing the Americas opening lecture that evening, but I did get to do a quick walk around the grounds. The first image in the post is a shot of the newly opened Bachman-Wilson House on the property. 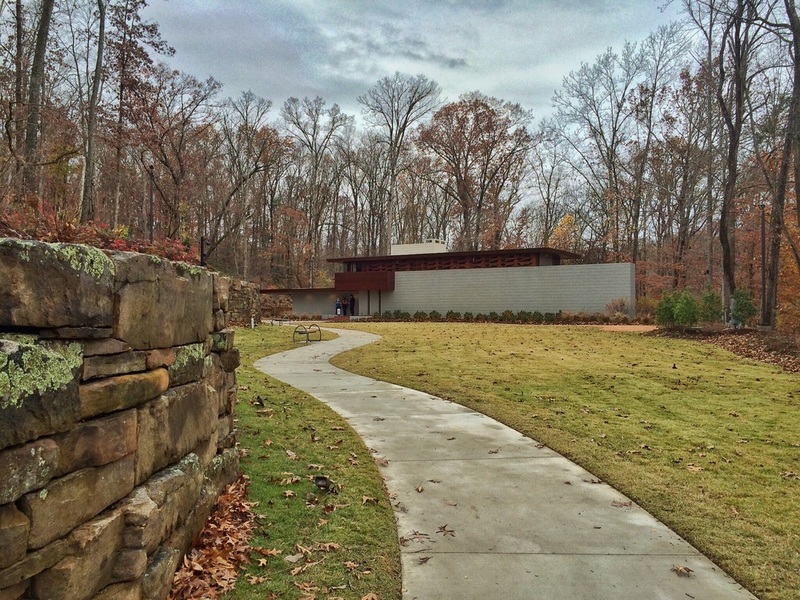 The Frank Llyod Wright designed home is a great addition to the numerous sculptures that dot the trails around the museum. Off the back side of the house is a deep ravine with a creek, even more walking trails and reflection pond. It fits effortlessly into the grounds and there are moments when it simply felt like someone's home set in the trees. I walked around it several times over the weekend and the way it was situated is absolutely stunning. The Moshe Safdie designed Crystal Bridges Museum of American Art. Speaking of the landscape and architecture, my first impression of the Moshe Safdie designed museum was of how seamless it worked with the surrounding landscape. The colors, lines and materials all directly pulled from the rolling hills of northwest Arkansas. At the main entrance to the museum is a sculpture by Roxy Paine that accomplished similar things, but in a much different way. The tree sculpture's metallic surface reflecting the colors and structure of the almost leafless late fall landscape. Those reflections really brought to life something that had the potential to feel cold and mechanical in contrast to its setting. 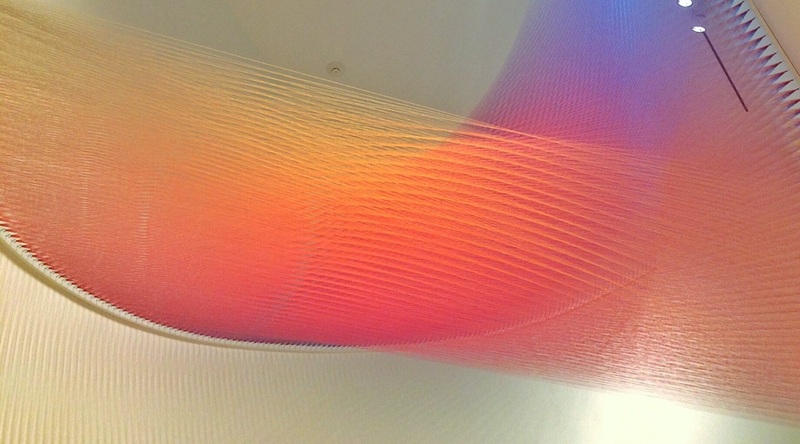 One of the few other pieces I was able to spend some time with on the first day was a Gabriel Dawe string installation. Placed in an off-side stair well, this piece is mesmerizing. I spent a good 10 minutes just walking back and forth underneath it watching the colors shift before my eyes. Gabriel Dawe, "Plexus No. 27" (2014). Only having a short amount of time before the kickoff lecture, that was the extent of what I was able to see the first day. Once the evening's event let out I retreated back to the hotel for some much needed sleep after a very long day of travel. I stayed at the 21c Hotel due to proximity with the museum, which is barely a 5 minute walk via nature trail and even thought its a bit more expensive I did save money by not needing a rental car. Hell I even walked over in the rain two mornings no problem. The hotel was very contemporary on the interior and my room felt a bit like staying in an Ikea. The neatest thing about the hotel is that it also served as a gallery/museum with multiple artists work displayed on each floor and dedicated exhibition spaces on the ground level. It was a nice break to see some ultra-contemporary work after looking at mostly historical pieces all day. They also have these funky green penguins that mysteriously move around the hotel, winding up in unusal places like packed into the elevators, on the roof and stalking you at breakfast (see my experience below). The biggest let down of the trip was that I missed Arnold Schwarzenegger by 20 minutes one morning, apparently he stayed there for a night while in town to do a quick tour of the museum. Should've spent a little less time on my hair that day...oh well. I got a little lazy with food this trip since most of my time was spent in the museum. Anyone that knows me knows that anytime I actually eat out it has to be something that I can't cook myself or haven't had before. Usually hotel restaurants aren't my favorite go to (looking at you Puerto Rico), but the one at 21c was an exception. The Hive is both conveniently located downstairs and also headed up by James Beard nominated Chef Matthew McClure, which is my book is a winning combination. Over the few days I stayed there I tried a good chunk of the menu and didn't find anything dissapointing. Most everything was cooked perfectly and delivered a solid fresh, but clearly Southern influenced breakfast, lunch and dinner. Some standouts were a scallop dish with peanut sauce (sounds odd but surprisingly good), a chocolate cake and one of the best bourbon cocktails I've ever had. It was the perfect spot to sit at the bar and enjoy a nice meal with a glass of wine after a long day exploring the museum. 21c Museum Hotel in Bentonville, Arkansas. One of those pesky green penguins came to visit me for brunch. The light around the bathroom mirror created some serioulsy neat reflections in the shower. Plus you could seriously fit 10 people in that shower. The lamps had to be my favorite and the bed was super cozy, which is really all that matters.